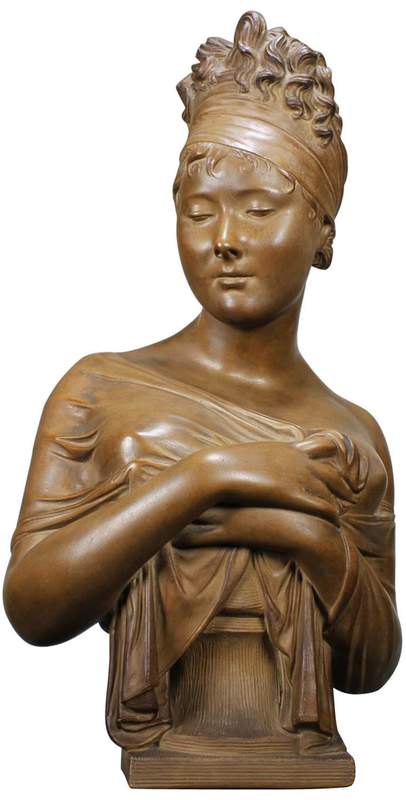 A Fine French 19th Century Terracotta Bust of "Madame Récamier (French, 1777-1849)" The coyly gazing downward beauty, holding a veil across her chest revealing her bosom, the veil gently falling over the integral socle, her hair bound with a cloth wrapped around the head, curls falling over the top, signed on the base HOUDON, after the model by Jean-Antoine Houdon (French, 1741-1828). Circa: Paris, 1880. Jeanne-Françoise Julie Adélaïde Récamier (4 December 1777 – 11 May 1849), better known as Juliette, was a French socialite, whose salon drew Parisians from the leading literary and political circles of the early 19th century. A native of Lyon, Jeanne-Françoise Julie Adélaïde Bernard was the only child of Jean Bernard, the King's counsellor and a notary, and his wife, the former Marie Julie Matton. In 1784, her father became the French receiver of finance. She was educated at the Couvent de la Déserte in Lyon briefly, after which her family moved to Paris. Jean-Antoine Houdon (French, 1741-1828) was a French neoclassical sculptor. Houdon is famous for his portrait busts and statues of philosophers, inventors and political figures of the Enlightenment. Houdon's subjects include Denis Diderot (1771), Benjamin Franklin (1778-09), Jean-Jacques Rousseau (1778), Voltaire (1781), Molière (1781), George Washington (1785–88), Thomas Jefferson (1789), Louis XVI (1790), Robert Fulton, (1803–04), and Napoléon Bonaparte (1806). He was born in Versailles, on 25 March 1741. In 1752, he entered the Académie royale de peinture et de sculpture, where he studied with René-Michel Slodtz, Jean-Baptiste Lemoyne, and Jean-Baptiste Pigalle. From 1761 to 1764, he studied at the École royale des élèves protégés. Bust of the Marquis de Miromesnil, 1775 CE. From Paris, France. By Jean-Antoine Houdon. The Victoria and Albert Museum, London. Houdon won the Prix de Rome in 1761, but was not greatly influenced by ancient and Renaissance art in Rome. His stay in the city is marked by two characteristic and important productions: the superb écorché (1767), an anatomical model which has served as a guide to all artists since his day, and the statue of Saint Bruno in the church of Santa Maria degli Angeli e dei Martiri in Rome. After ten years stay in Italy, Houdon returned to Paris. He submitted "Morpheus" to the Salon of 1771. He developed his practise of portrait busts. He became a member of the Académie de peinture et de sculpture in 1771, and a professor in 1778. In 1778, he modeled Voltaire, producing a portrait bust with wig for the Comédie-Française; one for the Palace of Versailles, and one for Catherine the Great. In 1778, he joined the masonic lodge Les Neuf Sœurs, where he later met Benjamin Franklin, and John Paul Jones. For Salon of 1781, he submitted a "Diana" which was refused without drapery. Bust of Washington based on a life mask cast in 1786, National Portrait Gallery, Washington, D.C. Houdon's portrait sculpture of Washington was the result of a specific invitation by Benjamin Franklin to cross the Atlantic in 1785, specifically to visit Mount Vernon, so that Washington could model for him. Washington sat for wet clay life models and a plaster life mask. These models served for many commissions of Washington, including the standing figure commissioned by the Virginia General Assembly, for the Virginia State Capitol in Richmond. Numerous variations of the Washington bust were produced, portraying him variously as a general in uniform, in the classical manner showing chest musculature, and as Roman Consul Lucius Quinctius Cincinnatus clad in a toga. A cast of the latter is located in the Vermont State House. Perceived as bourgeois for his connections to the court of Louis XVI, he fell out of favour during the French Revolution, although he escaped imprisonment. Houdon returned to favor during the French Consulate and Empire, being taken on as one of the original artistic team for what became the Column of the Grande Armée at Wimille. He was made a Chevalier de la Légion d'honneur, on 17 December 1804. A Fine French 19th Century Terracotta Bust of "Madame Récamier (French, 1777-1849)" The coyly gazing downward beauty, holding a veil across her chest revealing her bosom, the veil gently falling over the integral socle, her hair bound with a cloth wrapped around the head, curls falling over the top, signed on the base "HOUDON", after the model by Jean-Antoine Houdon (French, 1741-1828). Circa: Paris, 1880. Jeanne-Françoise Julie Adélaïde Récamier (4 December 1777 – 11 May 1849), better known as Juliette, was a French socialite, whose salon drew Parisians from the leading literary and political circles of the early 19th century. A native of Lyon, Jeanne-Françoise Julie Adélaïde Bernard was the only child of Jean Bernard, the King's counsellor and a notary, and his wife, the former Marie Julie Matton. In 1784, her father became the French receiver of finance. She was educated at the Couvent de la Déserte in Lyon briefly, after which her family moved to Paris. Jean-Antoine Houdon (French, 1741-1828) was a French neoclassical sculptor. Houdon is famous for his portrait busts and statues of philosophers, inventors and political figures of the Enlightenment. Houdon's subjects include Denis Diderot (1771), Benjamin Franklin (1778-09), Jean-Jacques Rousseau (1778), Voltaire (1781), Molière (1781), George Washington (1785–88), Thomas Jefferson (1789), Louis XVI (1790), Robert Fulton, (1803–04), and Napoléon Bonaparte (1806). He was born in Versailles, on 25 March 1741. In 1752, he entered the Académie royale de peinture et de sculpture, where he studied with René-Michel Slodtz, Jean-Baptiste Lemoyne, and Jean-Baptiste Pigalle. From 1761 to 1764, he studied at the École royale des élèves protégés. Houdon won the Prix de Rome in 1761, but was not greatly influenced by ancient and Renaissance art in Rome. His stay in the city is marked by two characteristic and important productions: the superb écorché (1767), an anatomical model which has served as a guide to all artists since his day, and the statue of Saint Bruno in the church of Santa Maria degli Angeli e dei Martiri in Rome. 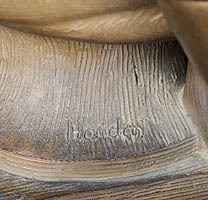 After ten years stay in Italy, Houdon returned to Paris. He submitted "Morpheus" to the Salon of 1771. He developed his practise of portrait busts. He became a member of the Académie de peinture et de sculpture in 1771, and a professor in 1778. In 1778, he modeled Voltaire, producing a portrait bust with wig for the Comédie-Française; one for the Palace of Versailles, and one for Catherine the Great. In 1778, he joined the masonic lodge Les Neuf Sœurs, where he later met Benjamin Franklin, and John Paul Jones. For Salon of 1781, he submitted a "Diana" which was refused without drapery. Bust of Washington based on a life mask cast in 1786, National Portrait Gallery, Washington, D.C.
Houdon's portrait sculpture of Washington was the result of a specific invitation by Benjamin Franklin to cross the Atlantic in 1785, specifically to visit Mount Vernon, so that Washington could model for him. Washington sat for wet clay life models and a plaster life mask. These models served for many commissions of Washington, including the standing figure commissioned by the Virginia General Assembly, for the Virginia State Capitol in Richmond. Numerous variations of the Washington bust were produced, portraying him variously as a general in uniform, in the classical manner showing chest musculature, and as Roman Consul Lucius Quinctius Cincinnatus clad in a toga. A cast of the latter is located in the Vermont State House. Perceived as bourgeois for his connections to the court of Louis XVI, he fell out of favour during the French Revolution, although he escaped imprisonment. Houdon returned to favor during the French Consulate and Empire, being taken on as one of the original artistic team for what became the Column of the Grande Armée at Wimille. He was made a Chevalier de la Légion d'honneur, on 17 December 1804.